This CellML model is known to run in COR to recreate the results in the published paper. The units have been checked and are consistent. The model will also open in PCEnv but currently will not run as the model produces NaNs. ABSTRACT: Alternans of cardiac repolarization is associated with arrhythmias and sudden death. At the cellular level, alternans involves beat-to-beat oscillation of the action potential (AP) and possibly Ca2+ transient (CaT). Because of experimental difficulty in independently controlling the Ca2+ and electrical subsystems, mathematical modeling provides additional insights into mechanisms and causality. Pacing protocols were conducted in a canine ventricular myocyte model with the following results: 1) CaT alternans results from refractoriness of the sarcoplasmic reticulum Ca2+ release system; alternation of the L-type calcium current has a negligible effect; 2) CaT-AP coupling during late AP occurs through the sodium-calcium exchanger and underlies AP duration (APD) alternans; 3) increased Ca2+/calmodulin-dependent protein kinase II (CaMKII) activity extends the range of CaT and APD alternans to slower frequencies and increases alternans magnitude; its decrease suppresses CaT and APD alternans, exerting an antiarrhythmic effect; and 4) increase of the rapid delayed rectifier current (IKr) also suppresses APD alternans but without suppressing CaT alternans. Thus CaMKII inhibition eliminates APD alternans by eliminating its cause (CaT alternans) while IKr enhancement does so by weakening CaT-APD coupling. The simulations identify combined CaMKII inhibition and IKr enhancement as a possible antiarrhythmic intervention. 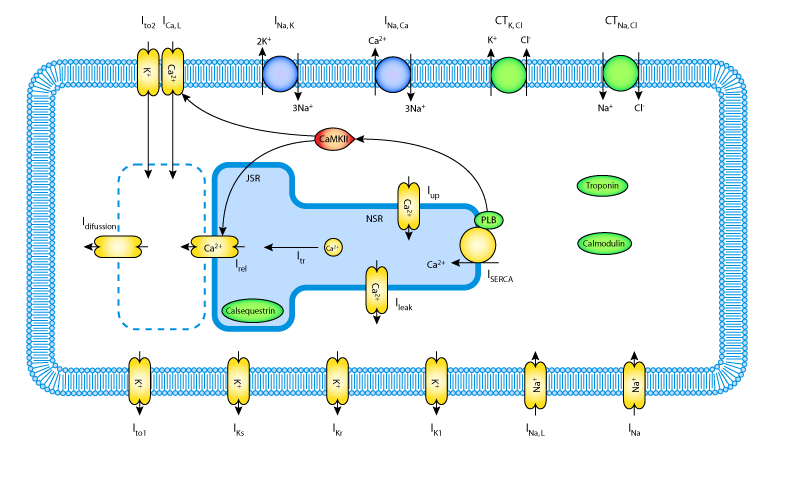 Schematic diagram of the currents and the ion exchanges described by the ventricular myocyte model. Derived from workspace Livshitz, Rudy, 2007 at changeset 4fff18dd880d.